Swimming pools are as diverse and exciting as the reasons you enjoy them. 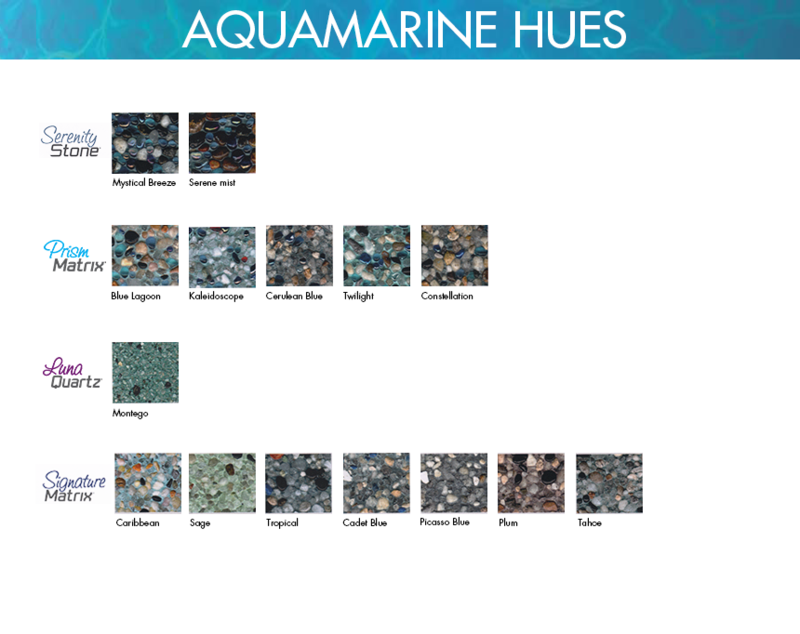 Guided by an unwavering passion for craftsmanship and integrity, our skilled artisans use a variety of textures, colors and styles to create the aquatic environment of your dreams. We have been building superior pools and personal oases in Southern Maryland since 1992. At Wise Pool & Spa, we offer you the best in all your pool and spa needs. Feel free to browse through for inspiration and give us a call at 301.932.4547 or stop by to set up an appointment. When choosing the best shape and size for your pool, we start with the shape and size of the space that you have available to you. Obtaining a site plat from the county will show you where you can and cannot build. A second factor affecting your initial design choices will be how many people will be enjoying your pool at the same time. Consider how you will be enjoying the pool. Certain shapes can add a romantic elegance to a midnight dip or allow longer laps for swimming exercises. Maybe a round or oval shape will encourage more playtime or a better party atmosphere. Let us know how you see yourself enjoying the pool for the best fitting design. Now that you have a solid idea on the size and shape, think about the water features that will enhance the style of pool that you are going for. Will your pool have a beach entrance or stairs and a bench? Add a waterfall or water jets for an elegant touch— maybe a realistic rock waterfall to merge your design with the rest of your backyard. The possibilities are endless. Adding features will require a more powerful pump, but with the technological advancements in pump design, you can reduce energy consumption while enjoying your dream design options. Remember to ask our pool designers about the energy saving options available for your design needs. 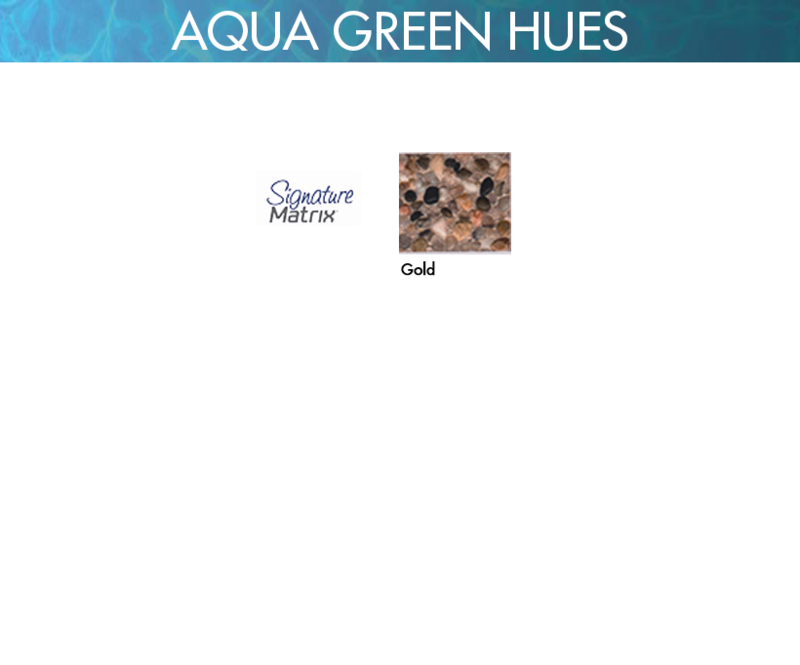 Consider the stunning visual impact of rich and vibrant water color by incorporating an aggregate finish to your pool project. This finish type is more durable than traditional plaster, resulting in easier care and a much longer expected life span, and is also comfortable on feet. An aggregate finish is made up of thousands of small pebbles , and sometimes enhancements such as glass beads, which has a distinct visual advantage over traditional plaster. It will look and feel more like a a natural body of water. Water color effects will vary depending on the shape of the pool, its depth, amount and angle of sunlight, and surrounding landscape. Each pool has its own unique hue. Waterline or perimeter tiles are necessary to avoid water line stains and to keep your finish safely under water. The tiles shown here represent a sample of what we have available. 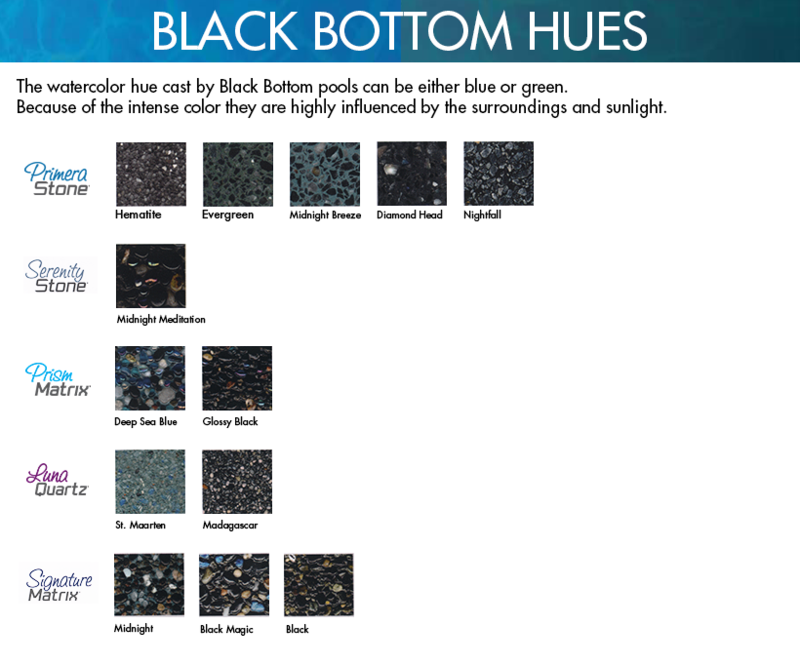 Visit our design center or look through our catalogue to see all of the styles and colors available. 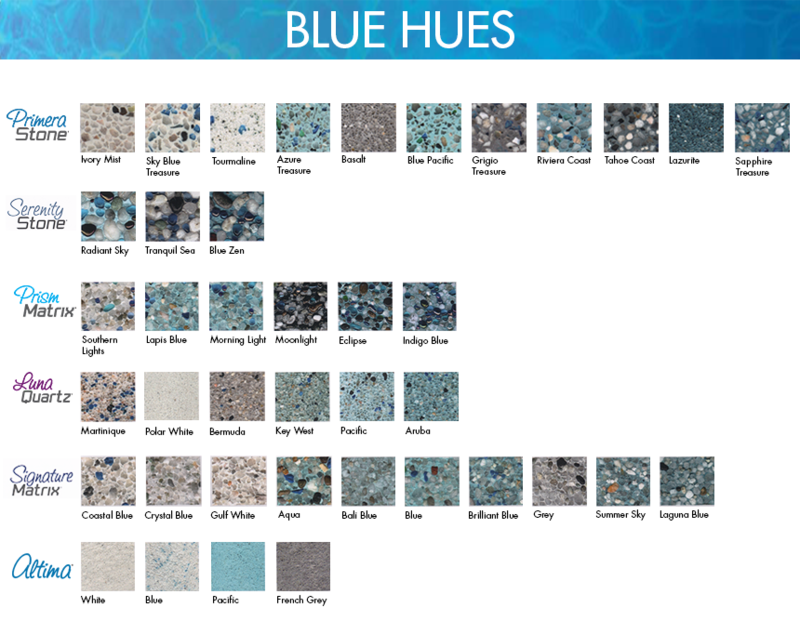 With so many colors and designs available, it can be confusing to determine what would look best for your pool. We have put together hundreds of beautiful color combinations and have several tried and true sets that we can recommend. Do you love dolphins? What about sharks? Turn your pool into an underwater adventure or add your personal touch with a pool mosaic. We have a lot to choose from. Swim along with tropical fish or hop a ride on a turtle. With our frost-proof porcelain and ceramic designs you can make your pool, one of a kind. For an added touch of realism, most of our fish and underwater mammal designs come with a shadow option. Imagine the reactions you will get when your friends see a shark skimming the bottom of your pool!